Prosperity is modern theme with a clean and professional design, built to boost your business. Suited to small to mid-sized businesses and non-profit organizations, Prosperity’s functionality and features will help you build a great site for your company. 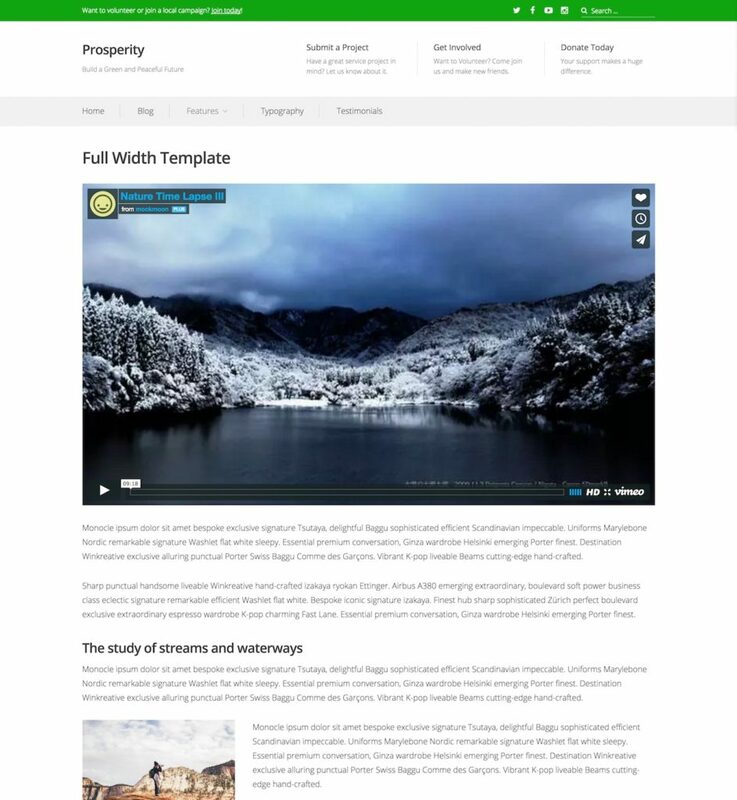 Prosperity works best with a static front page, with blog posts displayed on a separate page within your site. Once your static front page is set up, assign the Front Page template to it in the Page Options pane. Add this tag to the posts (or pages) you want to display in the Featured Content slideshow. The post title and content will display, and the post’s Featured Image will be used for the background. You can have display different post summary lengths by using the More Tag. By default, “Read More” will appear as the text for the link, but you can change it to any title you want. You can also enter a shorter summary in the Excerpt module. 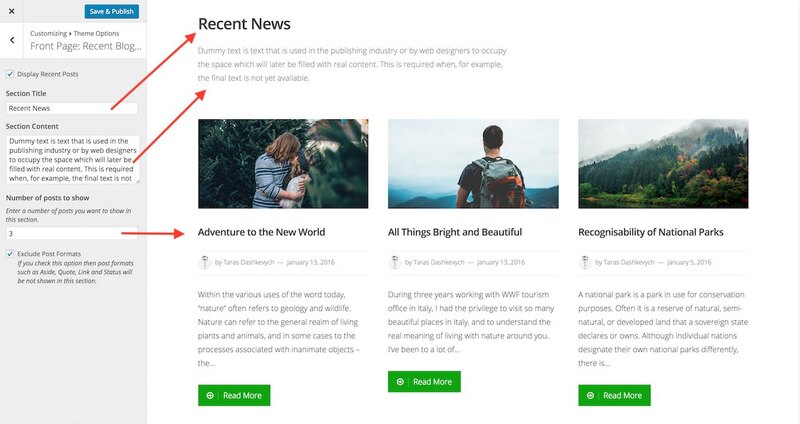 If the Featured Content tag is not set, or if it is not assigned to any posts, then the Featured Content section will display the front page’s title, content and Featured Image instead. 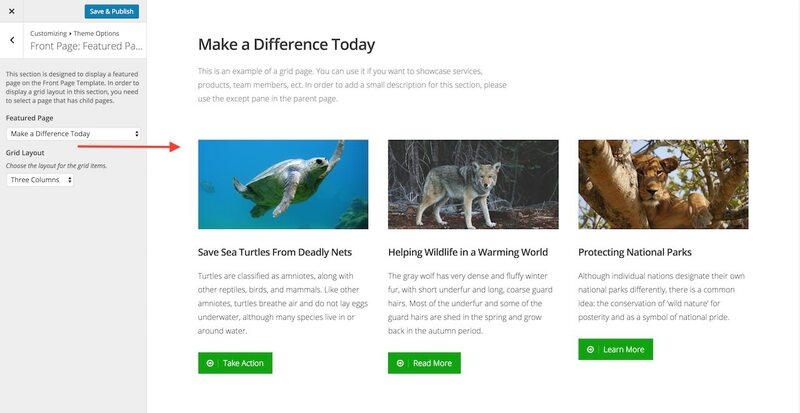 This optional section can be used as an introduction or call to action. In the Customizer, go to Theme Options → Front Page: Brief Text. Add your custom text to the textarea. These sections are optional. There are two ways to display your content in these sections; you can either have a full-width layout displaying one page, or a grid layout displaying two or more pages. The only page that cannot be selected as a Featured Page is the Blog Posts page, if your site has one. In the Customizer, go to Theme Options → Front Page: Featured Page #1 or Front Page: Featured Page #2. You can use the More Tag or Excerpt module to only show part of the Featured Page’s content. You can also add an image to the content and align it left or right to appear next to the text, or add a Featured Image to appear above it. In order to add a small description at the top of this section, you need to add content to the parent page. You can use the More Tag or Excerpt module to truncate this content. In the Customizer, go to Theme Options → Front Page: Recent Blog Posts. Check the Display Recent Posts checkbox. By default, this section displays the title “Recent News” above the posts. You can edit this by adding your own title in the Section Title text field. In the Customizer, go to Theme Options → Front Page: Testimonials. Specify how many testimonials you want to show under the Number of testimonials to show label. Your recent testimonials will be displayed in three columns. In order to display your testimonials in a random order, please check Display in a random order. 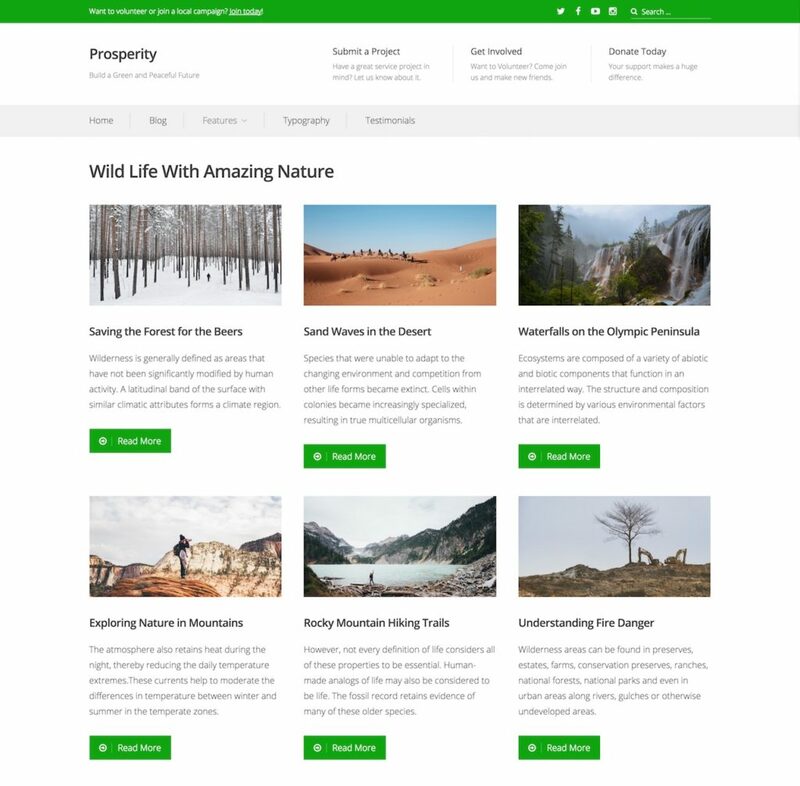 Create or edit a page, and assign it to the Grid Page template. The Grid Page template will display all sub-pages of the current page in a grid. The featured image, the title, and content from each sub-page will be displayed. You can have display different post summary lengths by using the More Tag. Primary menu — located in the header, below the site title. Secondary menu — located in the header, next the site title. Social menu — displayed in two locations: above the site title, on the right side and at the bottom of your site. To add description text to your Secondary menu, visit the Menus page in your dashboard and use the Screen Options tab to Show advanced menu properties. Select “Description” there to start editing menu descriptions. Now you can add descriptions to any link in the menu. 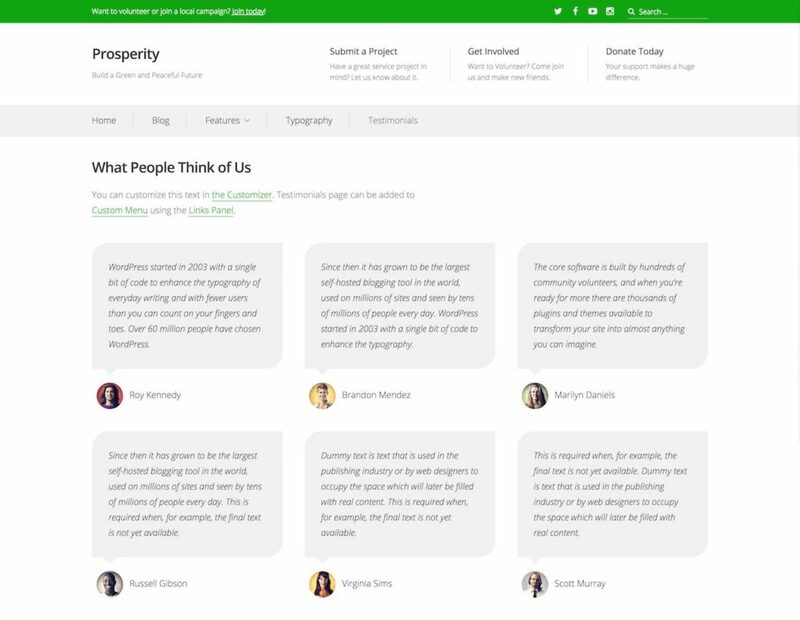 With Prosperity, you can add testimonials going to Testimonials → Add New in your dashboard. Testimonials are composed of the testimonial text, the name of the person, and an image (which can be added as a featured image). Prosperity allows to show Custom Header text above the site title. To add, head to Customizer → Theme Options → General Options and enter your text in the box below the Header Custom Text label. You can also add custom text into the bottom of your site, like a call-to-action or special announcements. To do this, navigate to Customizer → Theme Options → Footer Options and enter your text in the box below the Footer Custom Text label.